Id like to make note before we start with the tutorial. Here, you can find IP address information of users that are currently signed in, and what page their looking at, also find out the latest news forum ForuMotion, and some Statistics too. The image can be anything that you wish to have. Yes you can make your own favicon. the forum will be in for all users. User’s can change this in their profile, under "preferences" I their "profile"
Date format: This can be changed a veray of ways, ill let you figure that out for yourself. format, ill also let u figure that out your-self. Basket: (This is the default name). You can change the name, delete it and/or keep it. 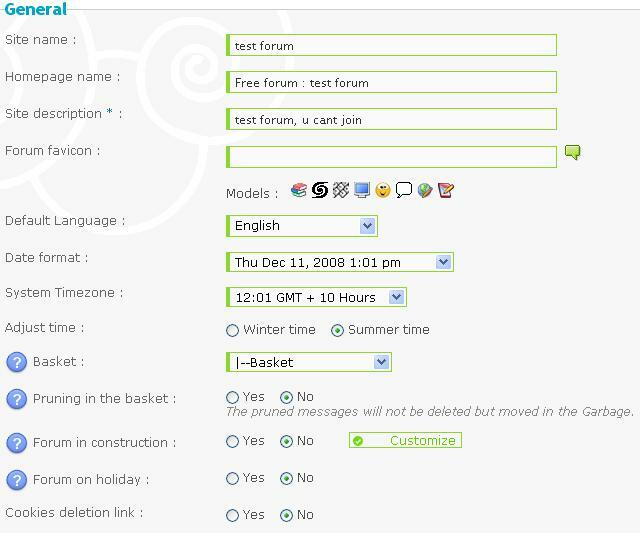 The basket is typically used as something that you can throw stuff that you don’t want into your forum into. Also for spam and other non-wanted items/messages. "construction" message, to whatever you want it to. Including adding a picture. 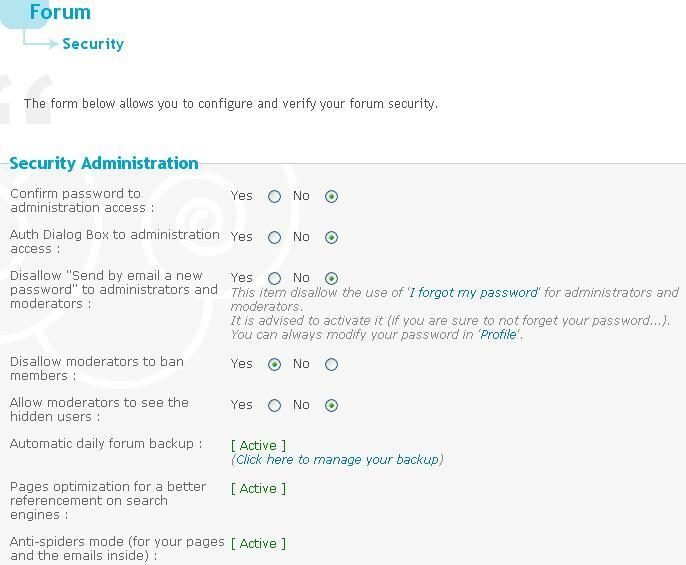 Forum on holiday: This will allow users to see your forum; however they won’t be able to log in, they also cannot sign up or make a post on the forum whilst this is in action. 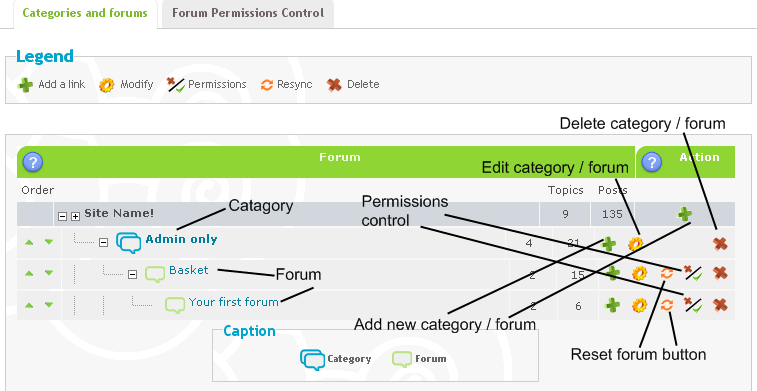 This will allow you to choose to remove the selected forum’s cookies. Topic length title: The amount of character’s that has to be in the title of the topic in order to make/post it. How many posts have to be made by users in order for something to become popular. 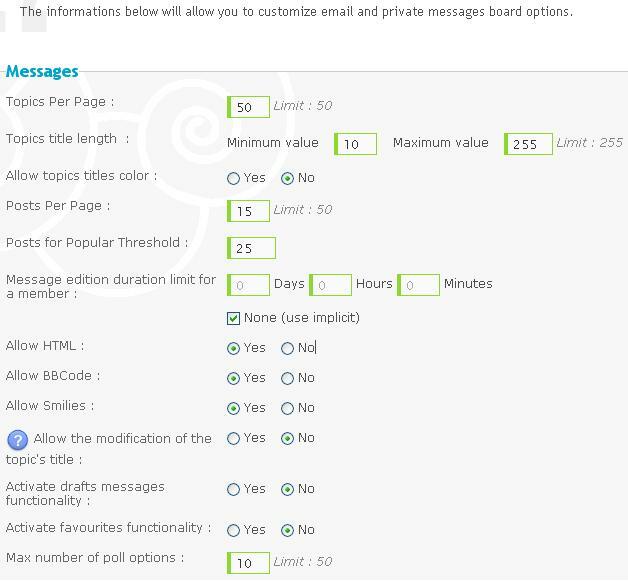 Message edition duration limit for a member: How long (minutes/hours/day format) a user can’t post for after he/she has made 1 post. 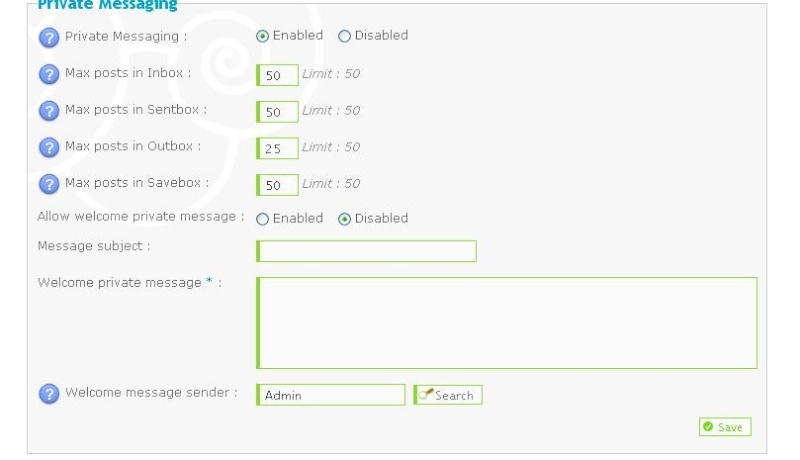 Allow HTML: Allow HTML so that users can use it in their messages on the forum. Allow BBCodes: Allow users to use BBCodes. Allow similes: Allow users to use smilies to express emoticons, or anything else that’s there. Activate favorite's functionality: Allow users to have favorites. Define another name for stickies and announcements: Make a new name for them. E.G. stickies, Read it’s and Announcements, Warning messages. What should separate them from other messages, a line, a table or not at all. Displays the status of the post in a caption. a new page, and will automatically happen when you do a quote. What you see is what you get mode. Basically, if you make text red, it will appear red to users and in the message as you type it up. Options: On/Off. A way you can type up a message, without having to load a new page. How to enable a "quick reply" such as the below screenshot? 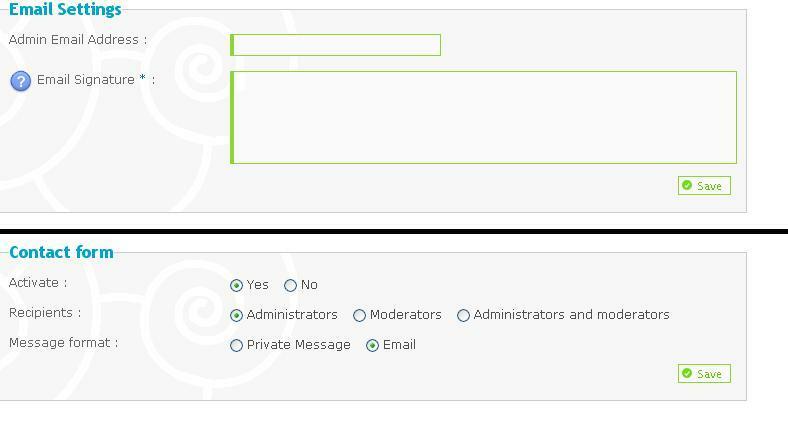 Administration panel >> General (tab) >> Messages and emails, scroll down to find the "Allow Quick Reply" as in the screenshot below. Can I just disable it for specific users? find "Private messaging" >> see screenshot for further info. (let users use it) or disable it (not let users use it). your "Welcome message" has been enabled. or any pictures you want included, or anything else. This is only an added extra if you wish to have it on your forum. and whether by Email, or by PM. Recipients: Who will receive it: Admins, Mods, or Admins AND mods. This is where you make, delete, lock and unlock categories/forums. user/user-group can see and do what in what part of the forum. with a different login box to provide information with. NOTE: you can choose to disable and enable this at times that you wish to. Allow the moderators to see the user’s whom have set their profile to private (cannot be seen by non-private users) but visible to Administrator with their username in italics like this. 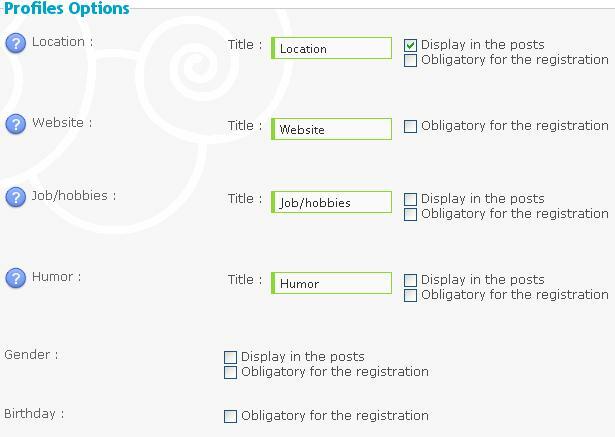 The following are associated with the Forum Founder utilities tools. No spiders inside your forum. End of forum founder utility tools!!! Bellow this is something called the "admin/mod action record box". This can only be seen by Administrators. follow the screenshot below and the little message in the spoiler. deletion, open it and follow the link on it. it is in the spam/junk box). did, we wish you the best of luck for the future. they can be anything such as cat, dog, mobile, computer, phone ECT. You can also choose what will its replacements (that's cool!). they cannot use the name they want. (an extract from a ForuMotion forum). New usernames won't be allowed to contain that word. For example, if "test" is forbidden, no name created after the addition of this censored word will contain "test". So "test", "test06", "fastest" and "fatest98" will be forbidden. Wright and Send: This is where you make the newsletter. stored, so you can re-send them when you want to. Reasons that the admin(s) create to have there, although the reporter can customize one of his/her own. onto the standard rules that come with the forum. 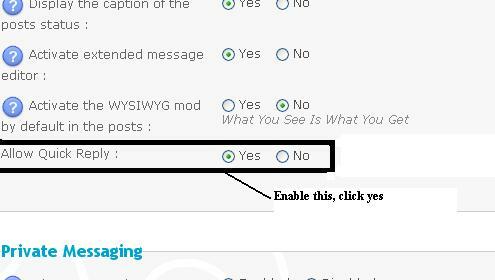 Any additional FAQ’s you wish to add to your forum, also under “FAQ” header, you can name them. Well, that's the GENERAL tab complete. I hope it has helped you out. A basic skin, nothing fancy look wise. Hitskin.com this is where all the fancy skins lie, these are only the best skins that are free to use. 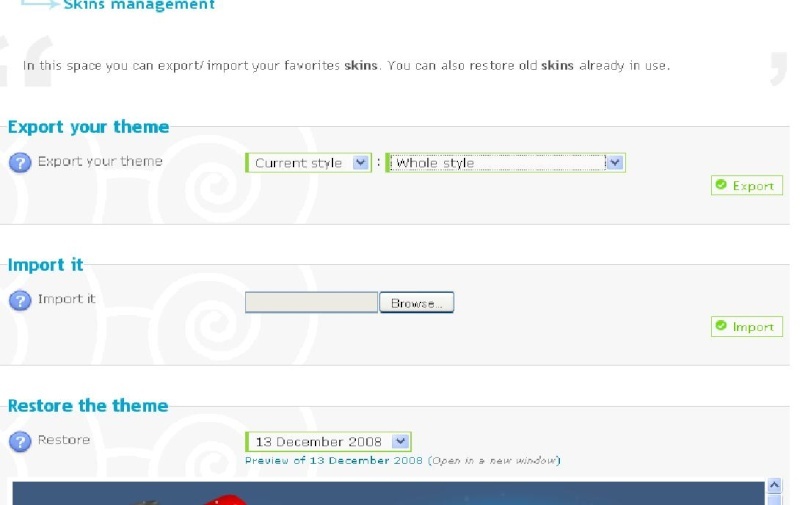 You can even make ur own skin and submit it to hitskin.com. Phpbb3: This is next step up, with much less customization available, and less coding to change too, but is simpler to use. PunBB: This one is simpler to use, is sophisticated in comparison to the phpbb version’s, not you cant do very much coding what so ever. 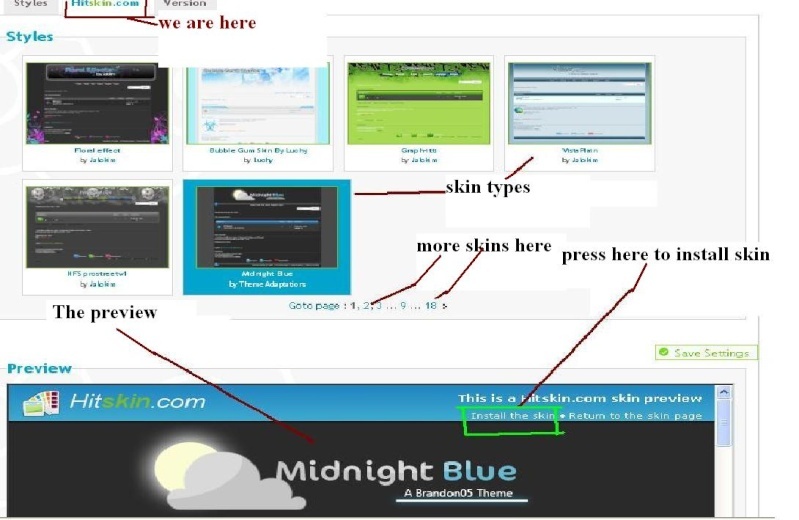 How to INSTALL a hitskin.com skin. You can take a part of the skin away to edit it or whatever takes your fancy and replace it with what you want to. Import anything you want, as long as it has to do with ur skin. Restore your theme to what it was at a particular date. The amount of time that the above ^^ is talking about. A quick log in box which enables you to log in another way other than loading the log in page. Options: Do not display/Top of home page/Bottom of home page/On the homepage Header and Footer. The name of the homepage message. This is where you can put a message for all users to see and read (just not guests), you can also put HTML codes in there, so you can play games on your forum, or put snowflakes flowing gently down your forum. Here is how you are currently referenced by search engines : basically the name, and description of your forum put together. Participate in the directory of ForuMotion forums. The category that the forum is located in. 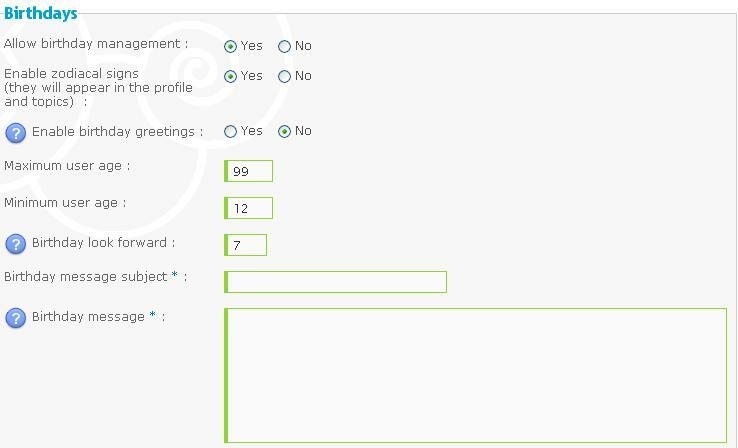 Show the last topic titles on index: show the LAST topic that was posted in on the main page of the forum…option Yes/No. How many letters of the last posted in category will be shown on the main page. Just another forum that shows up on the main page. Display who the moderator(s) are. Display the "who is online"
Display if the Google yahoo or msn bots are indexing your site. Logo positioning: The position of the logo. Display the name of the forum. Show only IMAGES in the navigation bar. NOTE: If you select "NO" you will see the pictures and the words. Menu position: the position of the navigation bar. Below are the standard links for your forum. You can edit, remove and add some of your own. Here you can see what type of user can see what. Select from: Guest, Member, Moderator, and Administrator. Pictures and Colors: ADVANCED MODE. Handle what pictures go where, have a look around here and get to know the buttons and everything. Colors: This is where all the colours are handled. Have a look around it, and get to know what edits what with the preview on the right hand side. Handle the smilies here, add more or remove some…this is all your choice. STOP!! STOP!! STOP!! STOP!! STOP!! STOP!! STOP!! STOP!! STOP!! 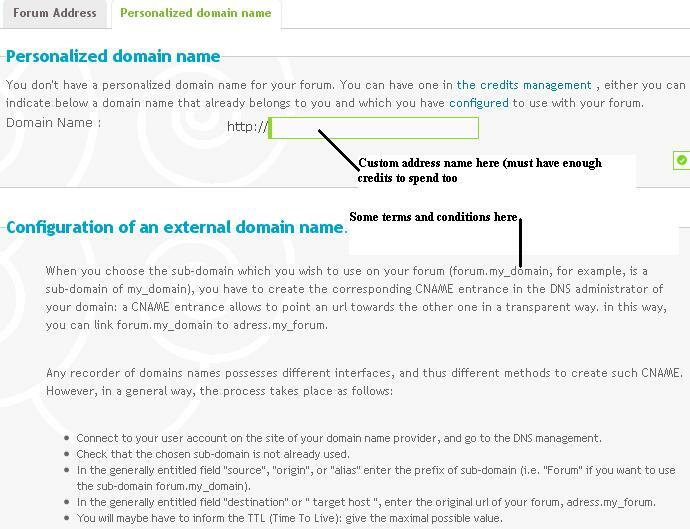 From here in you need to have your forum version set to phpbb2 in order to do template customization. You can customize each of these to your likings to suit you as much as you want. I am not going to go into the customization, because it is not something I know how to do. Well, that's the DISPLAY tab complete. I hope it has helped you out. This tutorial was written by Darren1. ok, this is the Modules tab, but I don't know much about it, so i have done the only thing i know. 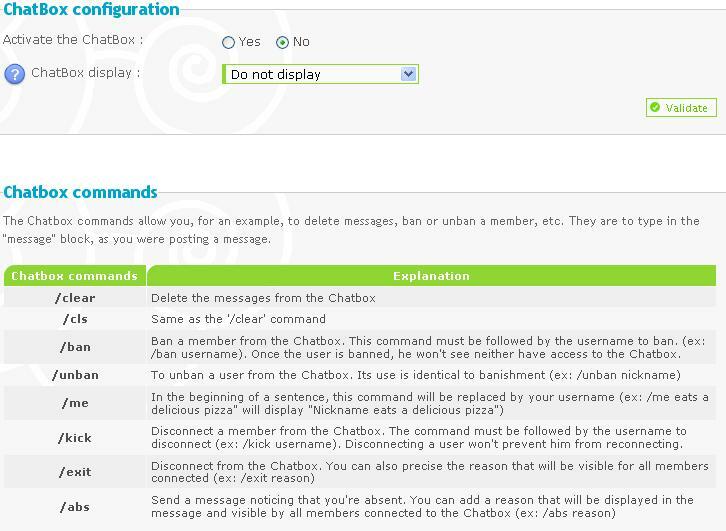 These are the commands for the chat box. 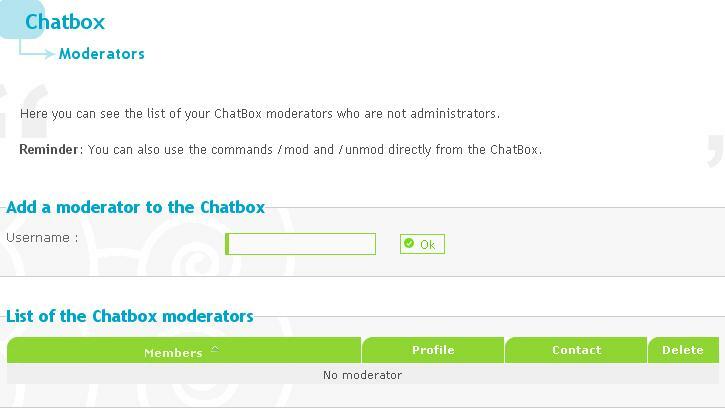 NOTE: in order to use/activate the above commands, you must have the moderator symbol “@” next to your name. This is the banned users. Type their username in the “username” box and hit the save button, and they will not be able to access the chat box anymore. 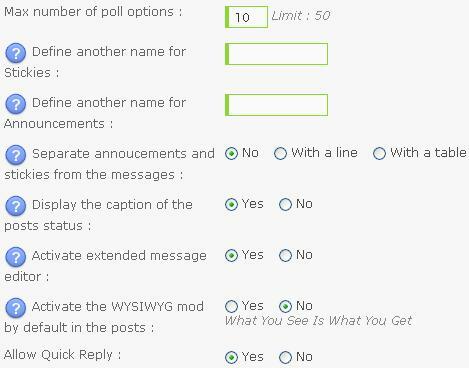 To make someone a moderator: Type their name into the “username” box. NOTE: for someone to be a moderator, they MUST have the “@” symbol next to their name. Don't forget, im logged in as FOUNDER account here. Credits available, the amount of credits that you currently have. Domain name, the current address of our ForuMotion forum. You can by credits using Allopass or via credit card & prepaid card. 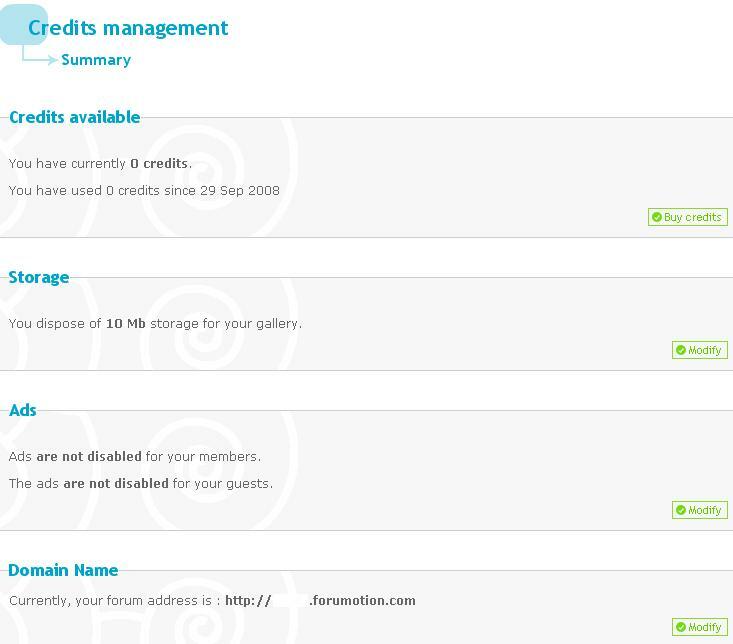 This is where you can see all the history of the credits purchase. This is another look at all the Statistics just a little more in depth. This is the display of the polls, and the votes for them. This is where the “complete” or “active” reports go. This is where you configure where you want your Servimg.com account to go to. Thank you for taking the time to read this, and I hope that this 'run through of the administration panel' has helped you. 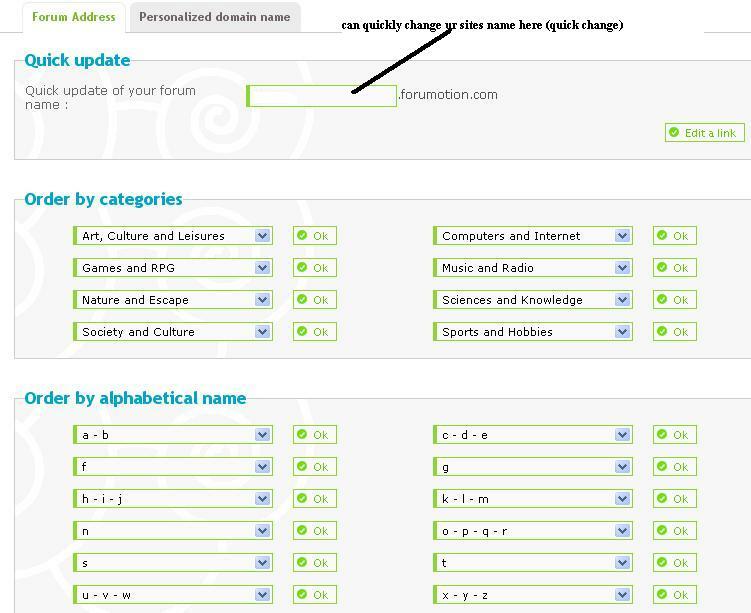 : Here you can search your user’s data, (under modify) you can change anything and everything. : you can see what the user can see, and what they can moderate in, from here you can also revoke particular user’s access to particular rooms. This is where you can enable/disable what users can use, such as signatures. This allows a new user to sign up to the forum, and now have to confirm themselves, or have an admin "ok" it, so they sign up, and log straight in. 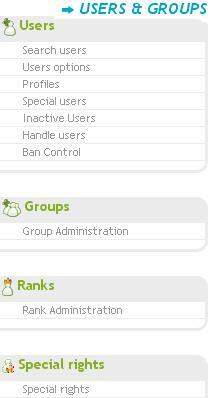 Administration pane l>> Users & Groups (tab) >> inactive users (side menu) >> tick the box, and click on the green "activate" box. Allow members to unsubscribe from mass administrators emails. Allow people that are not logged in(or registered) to vote on polls. 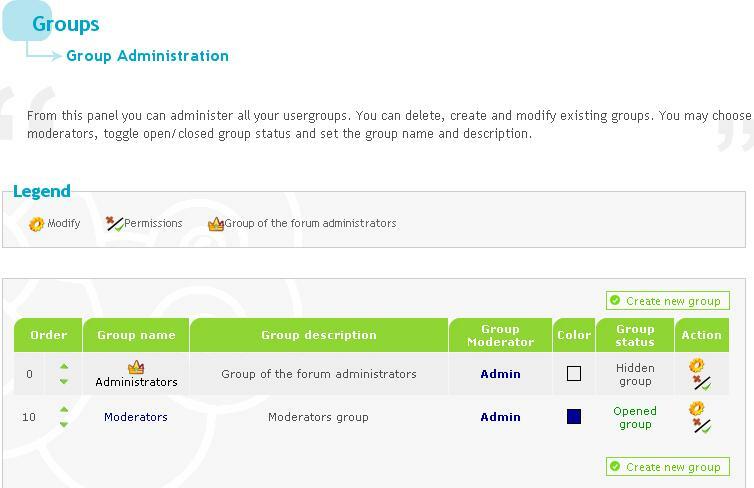 Allow a user whom is apart of a group (such as admin) have that group’s color, as the color for their username. All members, Allow everyone on your forum have signatures. Groups, allow only groups have signatures, you can chose what groups can use signatures too. No, No-one can have a signature, not even Administrator(s). Allow a user to change his/her username. Allow users to change their email add. Allow users to block particular users’ PM, and also say that they are friends, or foes (enemies) with particular users. This is all basic, nothing to really say here. Location, Country, anything else they wish to add. Job/hobbies, any work they do, or hobbies such as sport they want to add. Humor, what you laugh at. Birthday, your date of birth. Obligatory for the registration, the user MUST supply this information to join the forum. Here you can do many wonderful things, from adding "reward" things, to a "warning bar" and so so much more. I'll let you have a little bit of fun with this, as I can type a billion things up, when u may not want to know them. Here you can tell who has moderating powers, admin panel access, been banned, or has their PM (private Message) box disabled. 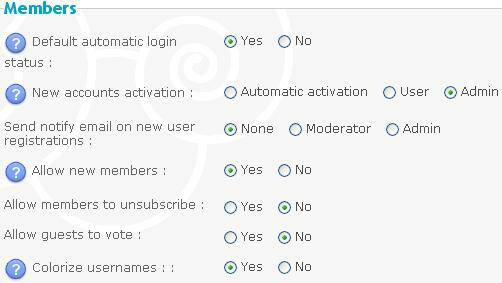 "New users" here you have the choice to activate any users, whom have not activated them selves by email (as user setting above) or if you have the user setting to "Admin" this is where you activate them. 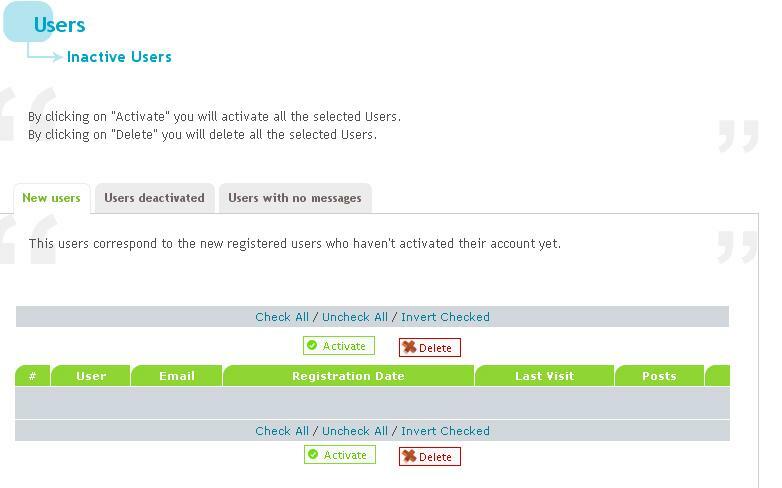 "Users deactivates" look at the users whom have had their accounts de-activated. "Users with no messages" look at the users whom are registered, but have not posted anything. 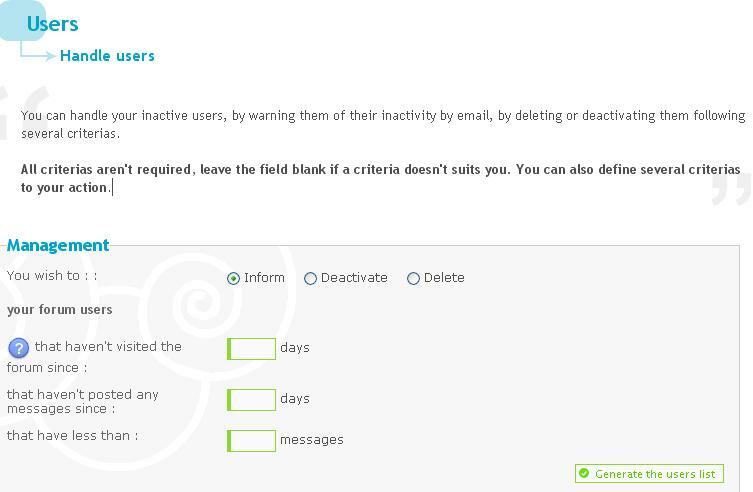 This is where you can choose what users you wish to send a news letter to, deactivate their account or delete multiple users' account. 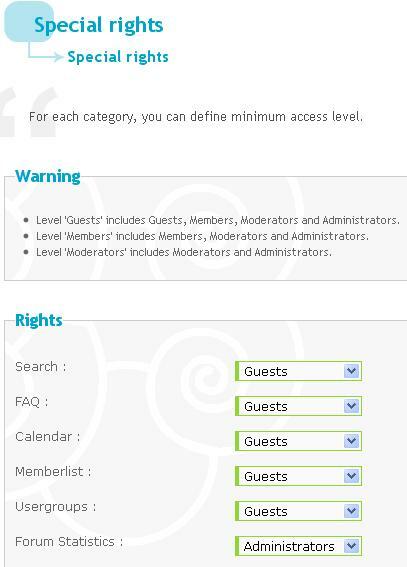 Once you have filled in the required information, you must click on the "generate the users list" button. Be extremely careful here, to not ban yourself, or the wrong user!! 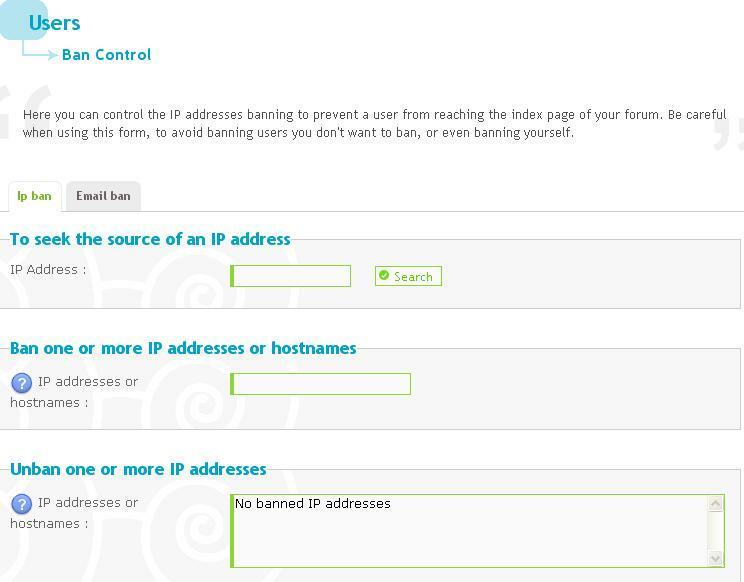 IP Banning: To ban 1 single person, insert their IP address in the 1st box. Email banning: insert the Email address that u wish to ban in the box in the email ban page. This is where you handle the groups that you wish to add. The "order number" is the order that they will appear on the home page legend. Clock the to make a new group. Click on the to edit a group. Click on the to edit the group’s permissions. This is where you handle your ranks. click the to delete the group. Click the button to add a new rank. These is where you can see who see’s what, and edit it, via the drop down menu. This is the end of the tab "Users & Groups".